The DFA door frame sill recess miller is a specialized machine designed for milling recesses in the sills of door frames under the angular lock plating in stationary frames and regulated frames. The machine’s base is a welded steel body made from sheet metal and steel sections on which a milling unit has been installed. The milling unit consists of a table with a regulated working height and a set of clamps immobilizing the detail being worked on. All work movements are effected by pneumatic actuators. Electrical equipment is located in one cabinet, permanently screwed down to the machine body. The milling unit consists of two linear slide bearings with an installed high-speed electro-spindle (3.3kW power, 18000 rpm), ensuring a high work quality. 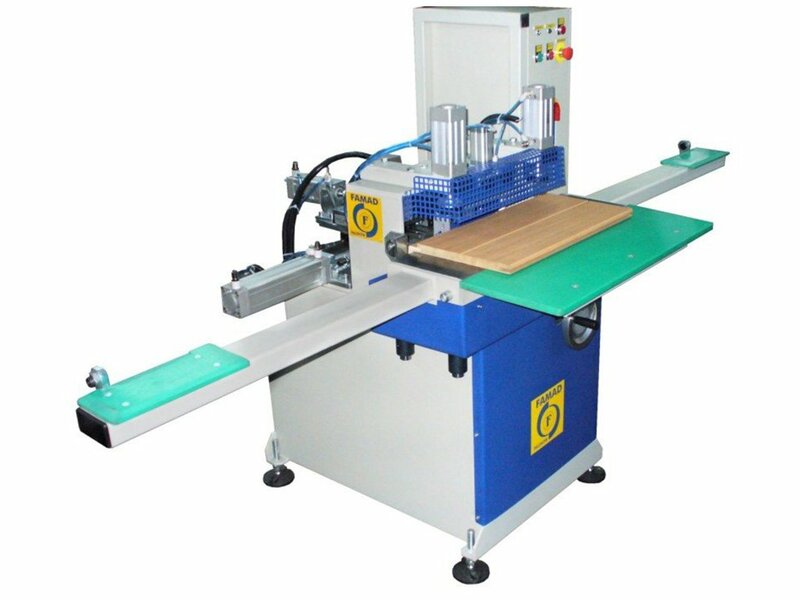 The machine works in an automated cycle, after sliding the worked material to the stationary bases, the cycle is started by pressing a foot switch, the material is automatically clamped, and the working process begins, after which the material is unclamped.